While this site is all about Scotland clearly there has been a great deal of interaction with England over the centuries. This section is simply to explore some of the history of England and the English to help build an understanding of that country and its interaction with Scotland. Also during the publishing of "Early Scotland" there were a lot of references to the Saxon Chronicles so I thought I'd include this publication here for additional reference. I will from time to time add the odd biography of Scots who were born in England of Scottish parents by way of showing how influential they were. In fact in the period 1790-1820 a staggering 130 Scots were MPs representing seats in England and Wales. Also in 2014 is has been recorded "There are more Scots in England than any city in Scotland. It might sound surprising, but according to the latest census figures, there are about 750,000 people born in Scotland who live south of the border. That's more than the population of Edinburgh or Glasgow. I hope by lifting the veil in this way it will encourage others to do more research and obviously we'd be more than happy to publish anything you produce on the subject. Since the page is rather long, I’ve attached the text below. The author will simply have been through all of the Members covered in our volumes for 1790-1820 and counted up the Scottish ones. Scotsmen sitting for non-Scottish seats numbered over 130, noticeably more than the Irish. With 45 seats in Scotland almost monopolized by themselves, the Scots still needed more scope. The eldest sons of Scottish peers, who were not eligible to be created peers of Great Britain until 1782, could not sit for seats in Scotland, and they are among the number. 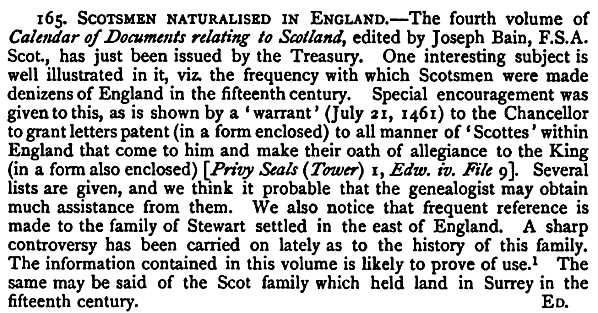 In addition, some Scottish peerage families had English or Welsh interests—notably the Butes. Apart from them, the Campbells, created Lords Cawdor, had Welsh interests. The Johnstone family interest at Weymouth brought in Scots Members; the Dundas interest in Yorkshire introduced members of the family. But, by and large, far more Scots than Irish might properly be termed adventurers: their own country could not support them. Many of them were nabobs—John Agnew, John Alexander Bannerman, Sir George Dallas, Philip Dundas, John Fleming, Charles Forbes, Joseph Hume, Sir John Macpherson, James Paull, Sir William Paxton, John and William Petrie, Patrick Ross, George Simson, James Charles Stuart Strange and Henry Trail come to mind. This was no coincidence: the East India patronage bestowed on his countrymen by Henry Dundas was at work. Apart from dominating Scottish elections, he also occasionally returned Scots for vacant English seats in which he was able to exert ministerial influence, and Scottish Whigs were more or less driven out of their country by him to look for seats elsewhere. Only 23 of all these Members ever sat for Scottish constituencies: the rest crept into every corner of the land for their seats. They were more likely than the Irish to be of mercantile background—London Scottish merchants were often ambitious of a seat in Parliament. David Hume is one of the great philosophers of the Western intellectual tradition. His philosophical writings earned him lasting fame and renown; his historical writing earned his bread and butter. His "The History of England from the Invasion of Julius Caesar to the Revolution of 1688", published between 1754 and 1764, was immensely popular and Hume wrote that "the copy-money given me by the booksellers much exceeded any thing formerly known in England; I was become not only independent, but opulent." The six volume work has had numerous editions and is still in print today. David Hume and Thomas Babington Macaulay have frequently been compared as the premier English historians but we don't have to choose because Macaulay begins where Hume leaves off. With the rest of the world we come with our homage to Macaulay. There is no occasion for us to quote from Macaulay, to criticise or to praise him. Our readers long ago have made their own quotations, selected their favorite passages, have read again and again every page of his history; and the universal approbation of the world has at once dispensed with the necessity of panegyric, and made censure impossible, except to those who are ambitious of a foolish singularity. On whatever side we look at this book, whether the style of it or the matter of it, it is alike astonishing. The style is faultlessly luminous; every word is in its right place; every sentence is exquisitely balanced; the current never flags. Homer, according to the Roman poet, may be sometimes languid; Macaulay is always bright, sparkling, attractive.— Westminster Review. Drawn with Pen and Pencil by the Rev. Samuel Manning LL.D. and the Rev. S. G. Green, D.D. Then his Majesties Sollicitor Generall, after Lord Verulam, Viscount Saint Alban including Post-Nati, Naturalization of the Scotch in England, Union of the Laws of the Kingdomes of England and Scotland (1641). As there are quite a number of Scottish Clans with Norman Ancestry I thought I'd make available this 4 volume publication.